The Van Kuijk Quartet members joined the ProQuartet residency in January 2014 (and were renewed in 2015). They succeed the Voce Quartet, in-residence from 2008 to 2012. 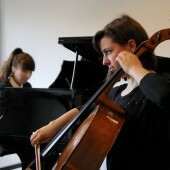 Looking for a chamber music partner ? You wish to practice chamber music but you are missing partners ?